My colleagues at DG Employment recently published the 2018’s edition of Employment and Social Development in Europe. The report identifies present and upcoming trends in technology, market structure and factor mix to produce policy guidance for the medium and long-term. Shrinking working age population, automation, flexible employment and erasable skills, lower earnings in the long-term and the poverty cycle are amongst the main topics of this enticing read. The EU labour market today is convincingly responding to a job-based recovery. Strong capital investment before 2000 depressed capital productivity as measured by output per capital unit, thus firms prefer(red) exploring labour-augmenting technologies such as factor reallocation platforms (the “gig economy“), short-term contracts, teleworking and other mobile technologies to increase returns and profits. As output per capital unit decreased, firms halted growth in capital per worker (a plateau is visible from 2013 onwards), instead increasing headcount. (data is AMECO and own calculations). Earnings of work (both formal and informal) are up more than 50% since 2000, as more labour-augmenting technologies compound shrinking labour demographics. 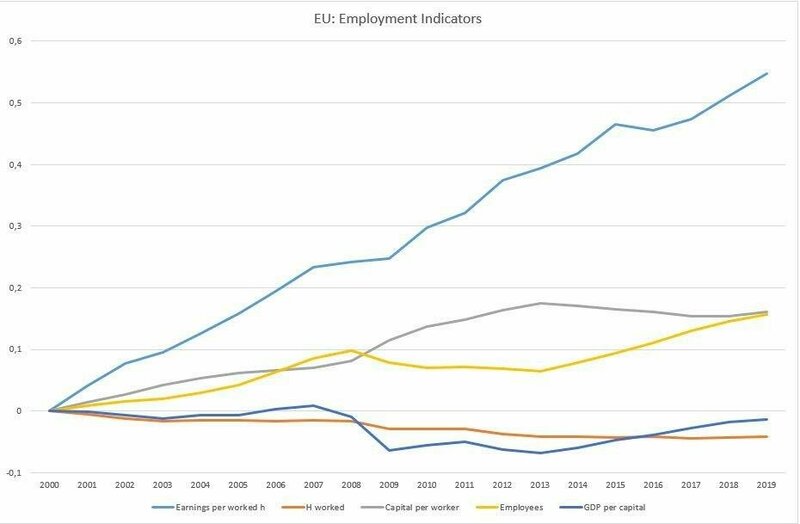 Whereas employment resumed the pre-2007 growth trend in 2013, employees worked less and attained higher productivity likely as a result of higher capital per worker that resulted of a reorganising recession where residential investment became less important. The concave/convex curves of employment and capital per worker hint at a certain degree of substitutability that, while promoting economic growth, would cause lower wages if firms were to continue pursuing capital investment. The capital investment trend is inverting as firms find profitability in pursuing capital-augmenting innovation. Going forward, this could mean even less work and decreasing labour earnings – if factors were complementary. Regulation and technological shock do not accelerate capital depreciation. As capital profitability recovers, firms are enticed to reinvest in capital, compounded by forecast interest rate increases that are now half of the growth rate in the US. Whereas policy makers may have a role in accelerating new technologies, firms are unlikely to accept light-hearted regulatory change while the opportunity-cost of investing remains this high. Thus in the short-term, we’re likely to continue living a labour-intensive recovery. How could this change? Next Article How could this change? We really love your blog, it has unique content, Thanks!